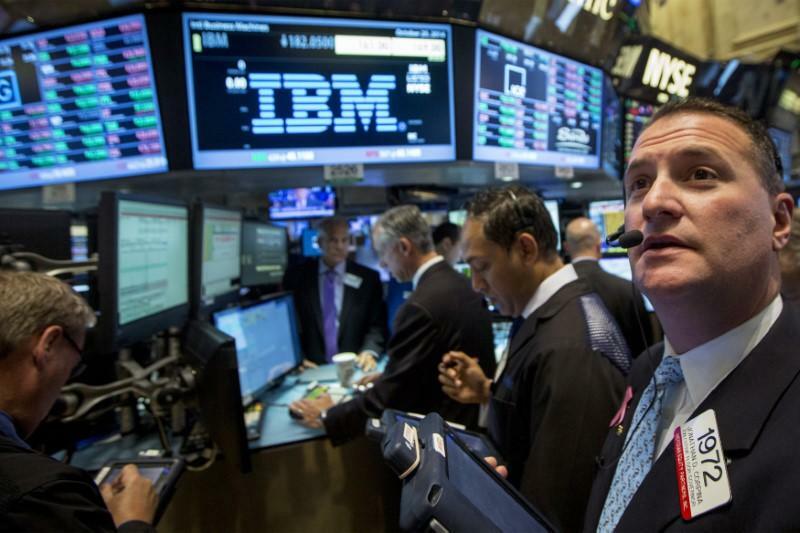 (Reuters) - Shares in International Business Machines Inc (IBM.N) surged 9 percent on Wednesday after it beat expectations on revenue and gave an outlook that hinted one of the world's first big computing names was back on a growth track after six years in retreat. There was no initial sign of changes to major brokerage ratings and most analysts shied away from calling a complete turnaround in the company's fortunes. But both Citi and Barclays raised their price targets for the stock, helping it towards its biggest daily percentage gain since 2009 -- a stark contrast with a nearly 12 percent fall so far this year. The rise in the share price, last at $159.79, added $12.6 billion to the company's market value and accounted for nearly 90 of the 105 point gain in the Dow Jones Industrial Average on Wednesday. "After a difficult first half, IBM turned in a solid quarter last night and we continue to believe the company will emerge from this transition a much stronger IT organization," Drexel Hamilton Brian White wrote in a client note. He has a "buy" rating on the stock and a $200 price target. Another analyst, Jefferies John DiFucci, argued that while IBM has struggled more than peers such as Oracle Corp (ORCL.O) and Microsoft Corp (MSFT.O) to adjust to a changing market, the quarterly performance of its software business was noteworthy. He warned against reading across from the firm's results to others in the sector. "IBM has historically served as an indicator of overall software industry health, and as the world's 3rd largest software vendor, its results are relevant," he said. "But we caution against direct read-throughs to other companies in recent times due to company-specific and secular challenges IBM has faced." Revenue at the company, one of the world's original PC producers but now a broad-based producer, integrator and software maker, has fallen for 22 straight quarters. Weak demand from customers had left its legacy hardware and software businesses stagnating. The results showed revenue from IBM's cloud, cybersecurity and data analytics business rose 11 percent to $8.8 billion in the quarter, accounting for about 46 percent of total revenue. The company's software revenue also grew for the first time after 13 consecutive quarters of declines. "We were pleased to see the quality of IBM's earnings improve, with IP income and taxes being less of a driver of upside than in prior quarters," Deutsche Bank analyst Sherri Scribner wrote in a note. But she added: "We see the business as secularly challenged due to its high exposure to a legacy business model, and see continued margin pressure over the long-term as IBM's business is pressured by competition from lower-cost offerings and the cloud." Out of 25 analysts covering the stock, only 6 have a "buy" or higher rating, 15 are on "hold", and 4 have a "sell" or lower. They have a median price target of $154.50. "The bottom line, IBM remains in a "work-in-progress" mode, as its continues to convert its revenue base away from asset/labor intensive legacy into asset/labor light "digital" solutions," Wedbush analyst Moshe Katri said.